As February brings Januarys grim weather along for the ride, we found ourselves in Jacaranda’s Phase One, on a stormy Thursday night, literally and metaphorically. As the world appears to be disintegrating before our very eyes it’s nice to be able to allow music to take us someplace else. Judging by tonight’s music, the mode of transport toward chaos may well be old rolling stock on a midwest, mid-century railroad. And frankly, if Brexit takes hold, its a mode of transport we should all get used to as they’ll all be brought back into commission. Sam Amidon hails from Vermont, and it appears to exist in the spirals of his very DNA, the hills, sweeping forest and rivers flow through him, via him, onto Seel Street. He takes us on a journey through folksville, sweeping by rolling country hills and forests into old Ireland via a fiddle that he may or may not have borrowed from a Megadeath roadie. He plays quite a short but very sweet set, singing songs about love, the world around us, trains, oddly enough, and being a travelling man in the mid-1800s. He plays a mix of his own compositions and a couple of olde worlde jigs and reels, its pretty special stuff this. He moves seamlessly from banjo to guitar, via a fiddle that he treats like, well, something that a Megadeath roadie might have given him. While his voice and songs are gentle, the fiddle, well, that’s a different kettle of fish. He does not treat it well, it’s all squeals, wailing, and feedback. The noise was so great, it sounded like it needed to be rescued at one point. Certainly not something we’ve heard before if you exclude the neighbours’ kid bashing some £20 plastic model from Home Bargains with a tennis racket. Interesting. Intriguing. And worth a second look. You could say that for most touring musicians, music is a way of life, not a chore, nor a job, most are surrounded by it. In this case, Sam Amidon literally is, in that he’s married to Beth Orton and is joined onstage by Laura Veirs for the second part of his set. The thing is with Sam, you can hear the influences of both in how he plays. They start with a song called Climbing High Mountains, a song about the trials and tribulations of getting home with little to work in and no transport. Again, possibly something we should all consider if the end of March brings doom. They move onto old folk tunes and end on a sweet love song, the harmonies are perfect and give us a hint of what we’re in for with Veirs. Not a bad start at all. 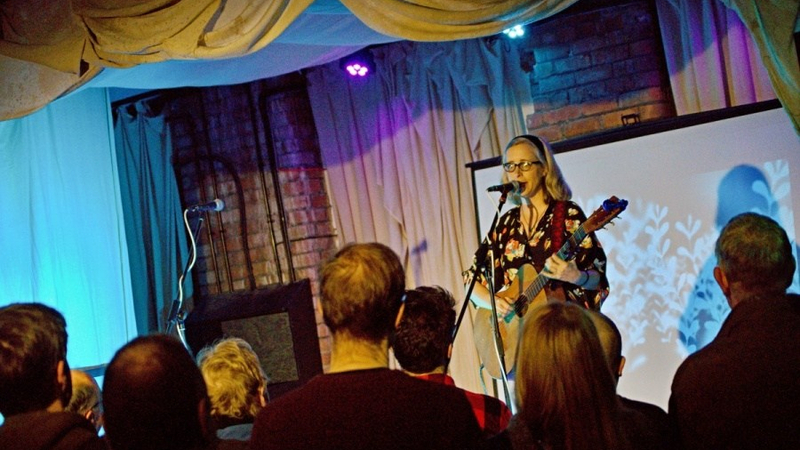 If you’ve ever been to the North West of the US you would probably get a sense of where Laura Veirs comes from, musically and spiritually. It’s a six odd hour flight to New York and another six-hour flight west toward Seattle. Throw in a layover and you have to be committed to heading there. Veirs lived in Seattle for years and now resides in Portland, you can hear it in every note she plays and song she sings. When you fly from the UK, there’s a very definite sense of being very far away from everywhere, the North West of the US has miles of untamed countryside, beautiful mountains, a sublime, wild coastline, miles of forests and it is distinctly ‘west coast’ in cities like Seattle and Portland. It’s almost Canadian. There is tons of art, a recognition of the early Americas and what was there before and a music history that speaks for itself. Veirs brings all this along as she plays gentle folk that is littered with her own harmonies, pulsating, gentle waves of emotion, and yet it’s expansive, wild, much like the North West. She plays a beautiful song about those friends that are hugely talented but remain unknown, The Best Kept Secret was a joy and a definite highlight; late night phone calls, laughter between friends and the secrets friends keep. Veirs tries valiantly to replace the horn section on the record with a series of “Ooos” to much amusement. Her heart was in the right place, as was the song. She follows Best Kept Secret with a cover of the Neil Young track, Unknown Legend. We weren’t sure if this had occurred to Veirs, but there was a suggestion among us that with this much love so for many unknown musicians, she might want to consider creating a label. She can clearly spot talent. The artist in question has delivered artwork for her tenth solo album The Lookout. Regardless of how the Pet Shop Boys feel about social media, ignoring the Brexshit nonsense and the fake news, the internet can be pretty awesome if you let it. Although we find blocking people and brands you don’t like, helps. She takes requests for much of the second half of her set, playing from an expansive back catalogue to a remarkably respectful audience, who, in a first for us in this city, only spoke when they were spoken to. Even at the very back of the room. (See, at the bar) While there were a couple that slipped her memory, each was welcomed with open arms. For her final three songs, Veirs brought Sam back on stage, their voices sounding surprisingly different with Veirs taking the lead, mercifully, Sams fiddle was given an easier ride towards the end. This is the kind of crowd that wasn’t for budging, their attempt to make it to the merch stand was thwarted and they returned to the stage, possibly to finish the fiddle off once and for all. The encore starts with Mountains of the Moon, a Grateful Dead song, a strange, trippy wander through the world of Grateful Dead. It’s a wonderful rendition that brings forth visions of Mount Rainer in the fall. If we had one niggling issue it would be the location for tonights show. Don’t get us wrong, we love Phase One. Just on a personal level, this gig needed a roaring fire, some oak around the bar and a leather couch or two. We have a friend who can get us the Loft Bar in Falcarragh and another who runs a wonderful B&B where the bedrooms are actually in an old 1920s train. Just in case anyone is asking. Next In the pit. With me.